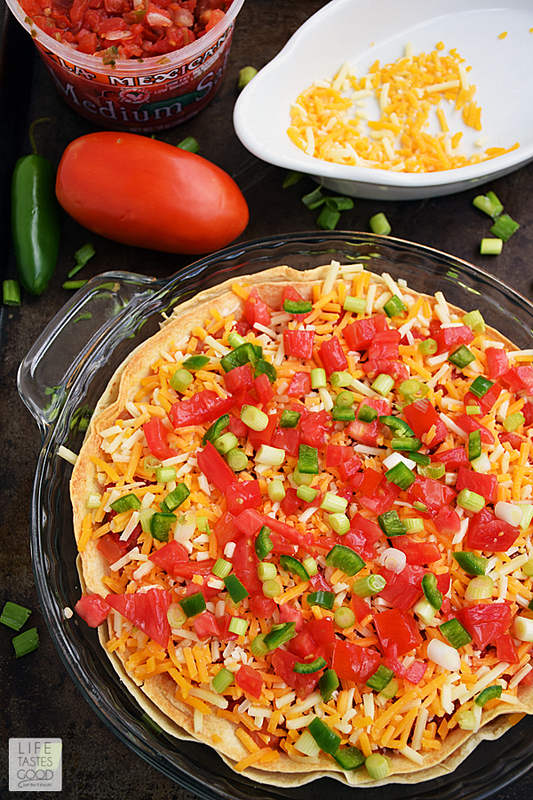 Taco Pie recipe with tortillas is an easy and budget-friendly recipe perfect for even the busiest nights of the week! 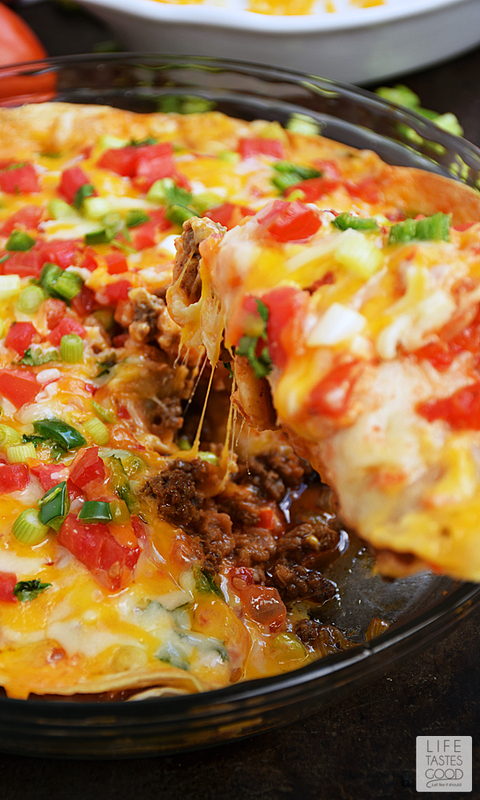 Refried beans and seasoned ground beef sandwiched between 2 large flour tortillas is topped with shredded cheese and fresh vegetables to create a Mexican inspired dish the whole family will love! Disclosure: Life Tastes Good is a participant in the Amazon Services LLC Associates Program, an affiliate advertising program. Please note: This post may contain affiliate links. 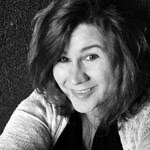 I earn a small commission, at no extra cost to you, to help with blog expenses when you make a purchase through an affiliate link. Thank you for your support! A taco is a traditional Mexican dish loaded with familiar flavors such as seasoned ground beef, beans, cheese, and vegetables all wrapped up in a handy tortilla making them easy to pick up and eat with your hands! Tacos are very versatile and can be made with a variety of flavors and textures. 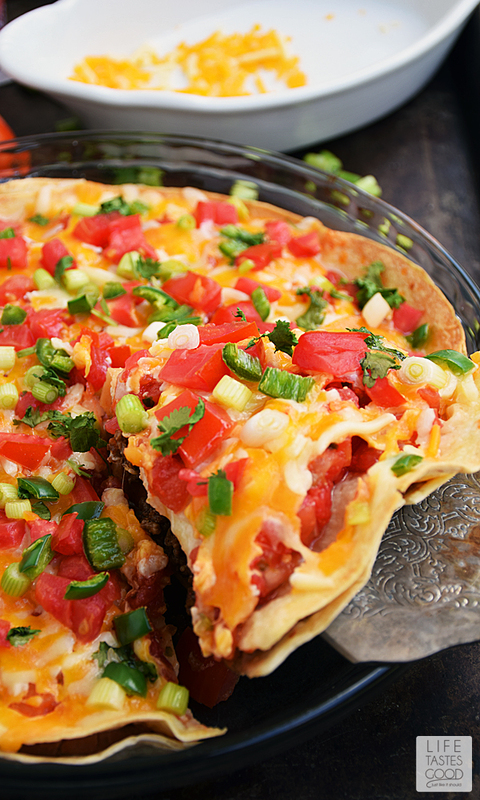 I am a big fan of soft tacos made with flour tortillas, which is probably why I'm a huge fan of this Taco Pie. 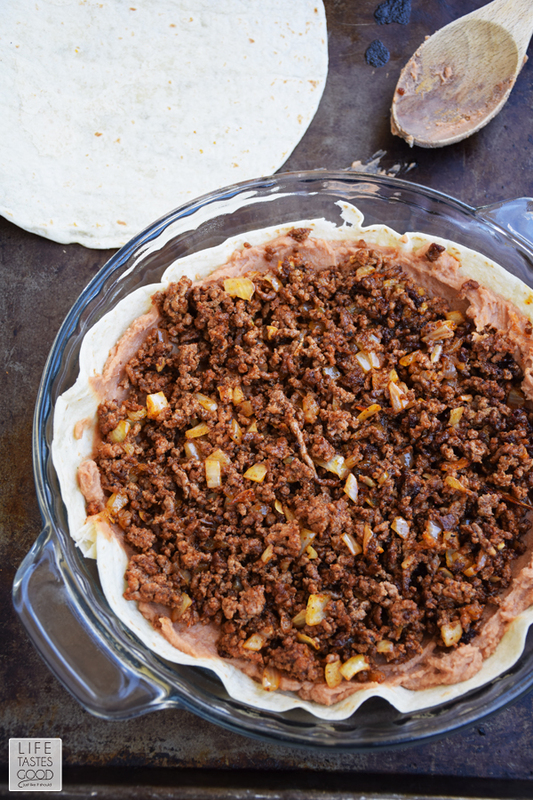 Although, the tortilla gets a little crispy while baking, that slightly crispy crunch adds a nice touch to this Taco Pie! NOTE: Scroll down past my photo tutorial for the ingredient list with directions. 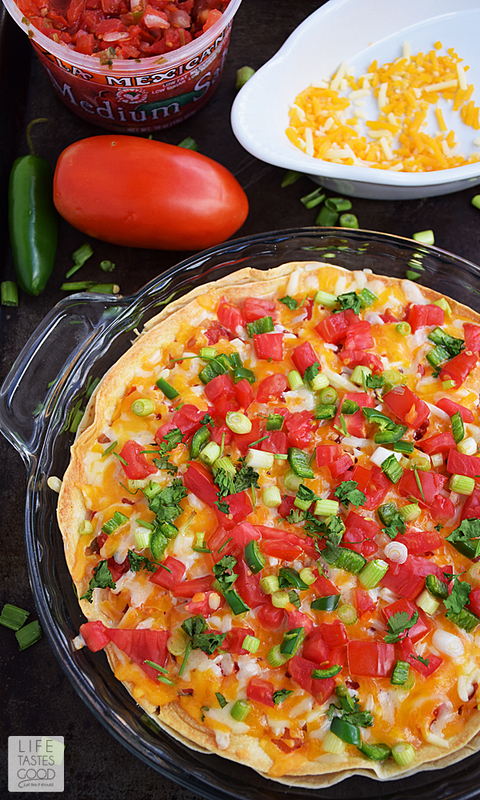 To make this Taco Pie recipe, preheat the oven to 375°F and spray a 9" pie plate with cooking spray. 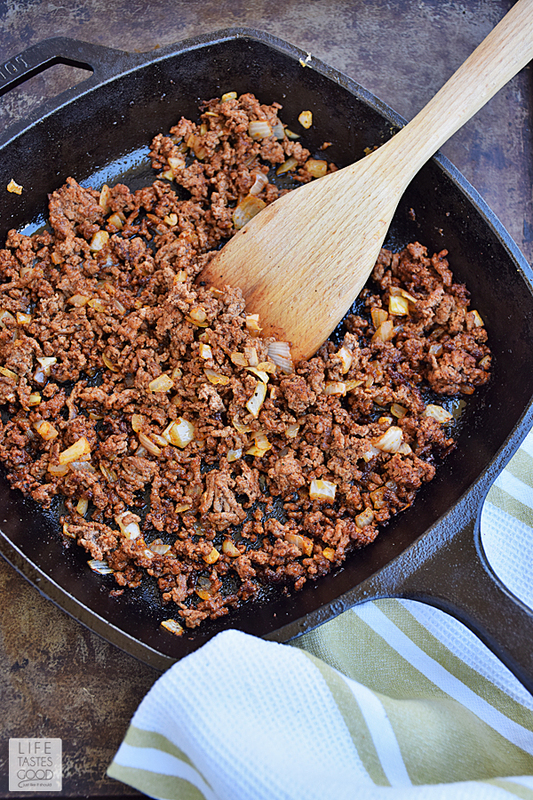 Brown 1/2 pound ground chuck with 1/2 cup finely diced onions and 1/2 tablespoon minced garlic. Season it with 1/2 tablespoon chili powder, 1 teaspoon cumin, and 1/2 teaspoon paprika, as well as salt and pepper to taste. I usually have those seasonings on hand, but if you prefer to use a store-bought taco seasoning it will work just fine. I recommend using 1/2 of a packet of taco seasoning and be sure to taste the meat mixture before adding salt. 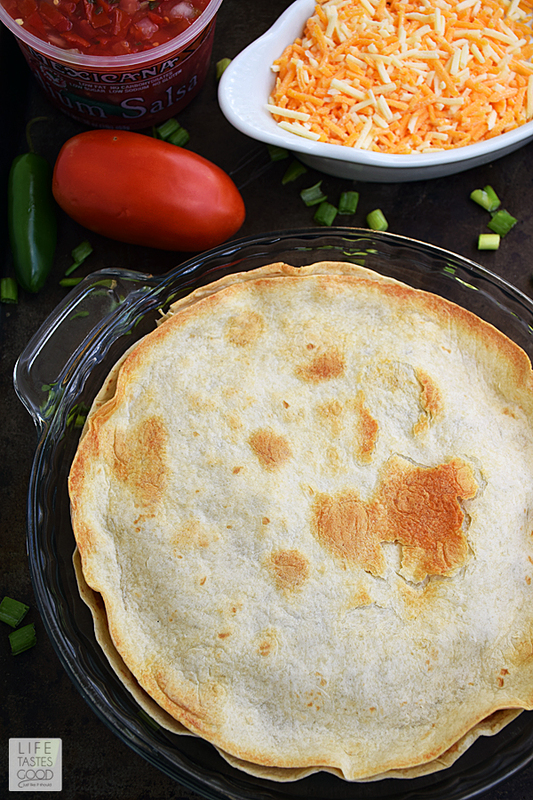 Place a large 10" flour tortilla in the bottom of the pie plate. It will go up the sides a little too. 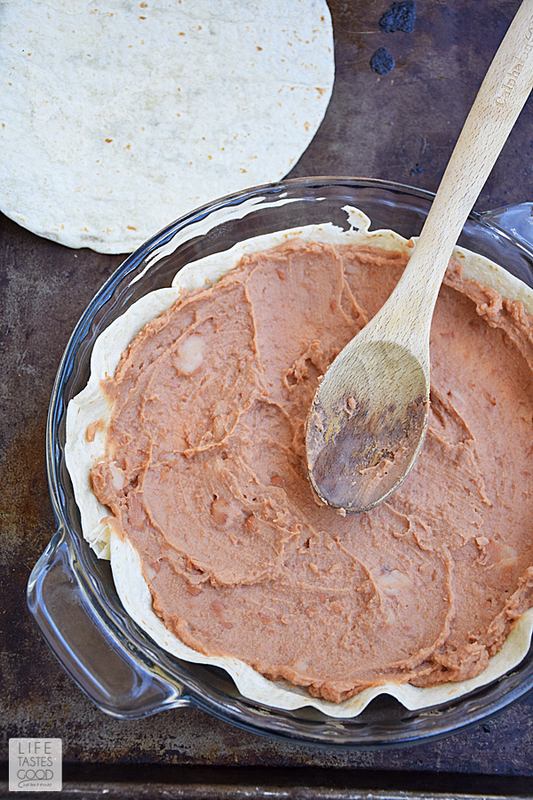 Spread the refried beans on the bottom of the flour tortilla. I used traditional refried beans, but I recently saw a can of refried black beans and would like to try that next time. Either will work in this recipe and each will bring their own unique flavor to the dish, so don't be afraid to mix it up for a change of pace. and place the remaining 10" flour tortilla on top gently pressing down at the edges. Bake in the preheated oven for 10-15 minutes until slightly browned. Bake in the preheated oven for another 5 minutes or until cheese is melted nicely. Garnish with chopped cilantro and serve with sour cream and Simple Guacamole. Enjoy!! Preheat oven to 375°F. Spray a 9" pie plate with cooking spray. Heat a skillet over mid-high heat and brown 1/2 pound ground chuck. Season beef with 1/2 tablespoon chili powder, 1 teaspoon ground cumin, 1/2 teaspoon paprika, 1/2 teaspoon kosher salt, & 1/2 teaspoon freshly ground black pepper. Add 1/2 cup diced onions and 1/2 tablespoon freshly minced garlic. Cook until the meat is browned all the way through and the fat is absorbed. Place one 10" tortilla in the pie plate allowing the tortilla to cover the bottom of the pie plate and go up the sides. Top with 8 ounces refried beans. 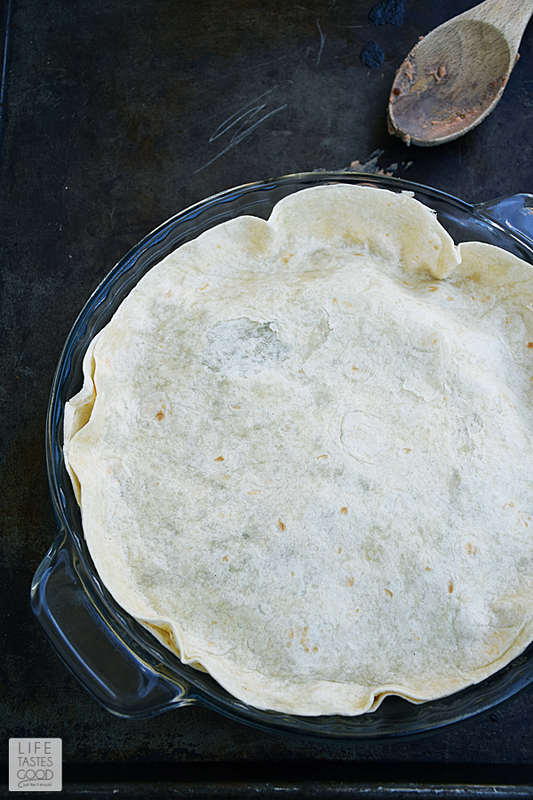 Spread to cover the tortilla evenly across the bottom of the pie plate. Spoon the meat mixture over the beans and spread evenly. Place the 2nd tortilla on top of the meat mixture and press down around the sides gently. Bake in the preheated oven for about 10-15 minutes until slightly browned. 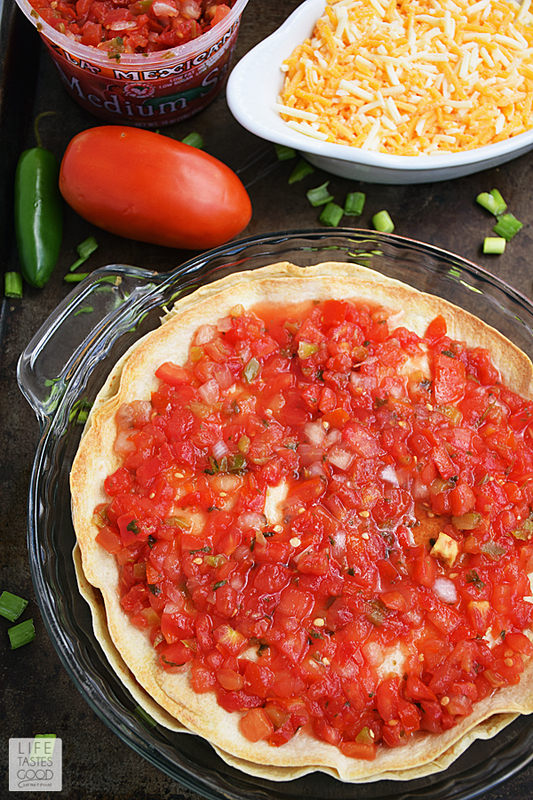 Remove from the oven and spread 1/2 cup salsa over the top of the tortilla. 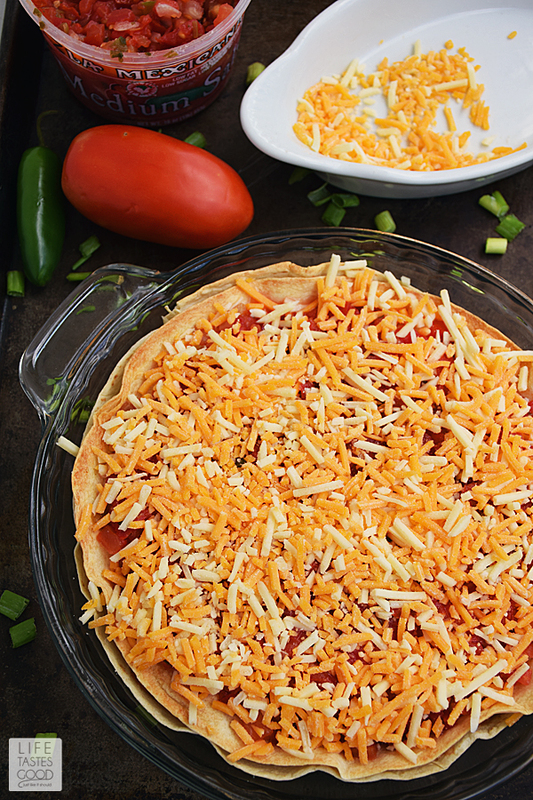 Sprinkle with 1 cup shredded cheese and spread the diced tomatoes over top of the cheese evenly. Top with 1/4 cup chopped green onions and 2 tablespoons finely diced jalapeno peppers. Bake for another 5 minutes or until the cheese is melted to your liking. Remove from the oven and allow to cool. Garnish with freshly chopped cilantro and serve with sour cream and Simple Guacamole. Enjoy! Thanks, Dorothy :) Hope you're having a super weekend!! Eating this right now- DELISH! Thanks. Fantastic! Glad you like it! Wish I had it for dinner tonight too :) Happy Monday! So what would be a great side dish for this? I know it pretty much has everything but my boyfriend just likes to have a full plate. My husband likes this with Spanish rice and sometimes he will have chips on the side. I like to pair it with a salad. I hope that helps! Happy New Year!! How can I print just the recipe without all the photos? I can't find a print button that will convert it to a printable recipe. Janet, I'm happy to email a printable version of the recipe. Please contact me at life_tastes_good@yahoo.com with your email address and I will send it. Thanks for stopping by! Could you quite easily make this three layers with a third tortilla and another layer of beans? Or do you think would it get soggy and not crisp up? "Mexican inspired" -- maybe. But Taco Bell has been serving this for over 30 years. It's not a new idea (they even used to put green onions on it). The only difference is that they fry the two tortillas FIRST then build it. 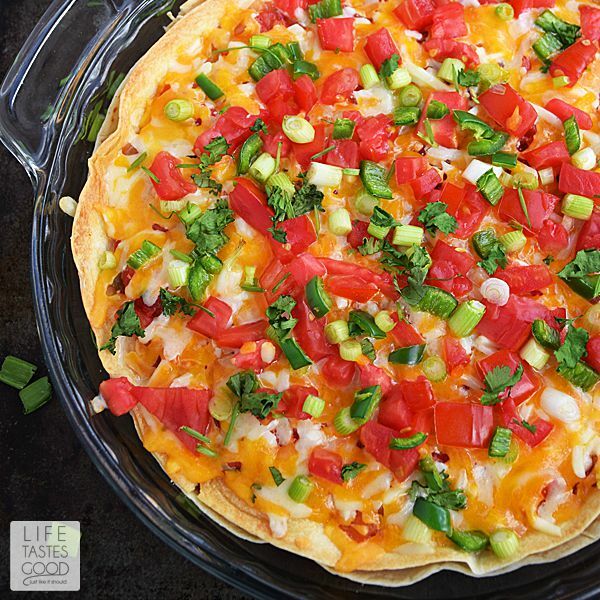 This looks really yummy, and so easy! I love it! This is the first recipe I have tried from Pinterest in 2018! Not disappointed in the least! I used low-carb tortillas and it was delicious! Was able to stay within my carb allowance and still enjoy Mexican-style dinner! Planning on trying this over the weekend with grandkids. It looks so good!!! What's not to like if you like tacos.